Work on the £15 million upgrade of Bath Spa station has begun. Network Rail started the modernisation works, which will see the platforms widened and track realigned, on April 8. It will continue until April 23 to allow the new, longer IEP trains to use the station later in 2017. This will also reduce the stepping distance from the curved platform by up to 50 per cent. Network Rail has set up a total of 62 sites at Bath Spa, scheduling 70,000 man hours in just 16 days across the project. It estimated that 150 people will be working on the upgrade scheme at any one time. Although services will continue to call at the station on weekdays during the two-week period, some trains will be diverted and bus replacement services will run during the weekends and bank holidays. 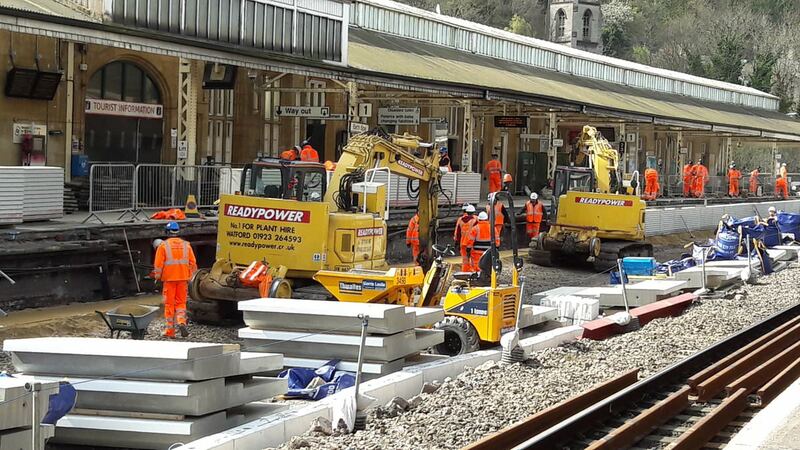 Michael Jones, project manager for Network Rail, said: “The modernisation works we are carrying out over the Easter period are absolutely crucial for Bath and the surrounding area. “The Great Western Main line is one of the oldest parts of our network and Bath itself is a world heritage site. In addition, works will be conducted west of Bath Spa, including a track lower under Newton Road and Cross Post bridges, making way for the new trains and for the future electrification of the line.